From Motown to Modern, We're Your "Road" to Classic Dance Hits for Your Special Event! - Planning consultation to best understand your event needs, preferences. - We tailor our song lists, balance dancing music vs. listening music, if needed. - Songs for all special wedding moments: Wedding Party introductions, First Couple, Father-Daughter dances, etc. - We dress to suit your event; whether formal attire for weddings or even theme costumes, as needed. - Male and female vocalists available for wedding ceremony performance. We can provide the artist CD original version over our sound system as a “DJ-type” service. 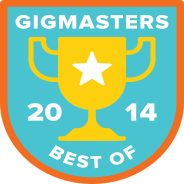 We received Gigmasters' "Best of 2012 Award, their "Best of 2013 Award" AND their "Best of 2014 Award." Professionalism, Overall Talent, Handling Special Requests, How Strongly Clients Would Recommend Us to their Friends and Overall Satisfaction. We reserve performance dates on a first-paid, deposit basis. May - September, (Weddings) and November – December, (holiday parties). Private Anniversary Party at private residence overlooking the water on Discovery Bay. Contra Costa Association of REALTORS® 2014 Inaugural Dinner & Dance. Honoring Incoming President Marilyn Cunningham and the 2014 Board of Directors. Three of AT&T's Northern California Employee Resource groups are collaborating to host a joint Crab Feed Dinner Dance Fundraiser on Saturday, March 16. Proceeds from this Crab Feed will go toward the High School Scholarship Funds for each of the three organizations. - Asian Pacific Islanders for Professional & Community Advancements, (APCA). - Community NETwork-AATP, (African American Telecommunications Professionals). - HACEMOS, AT&T's Hispanic Latino employee resource group. Dinner Tickets at $45. each.